Once we have built a network connection and you need electricity to build a house, we have a solution for you in the form of a junction box for the period of the construction work. We offer a complete solution. After installation, we will sign a network contract with you and supply electricity. A switchboard can be ordered anywhere in Estonia. 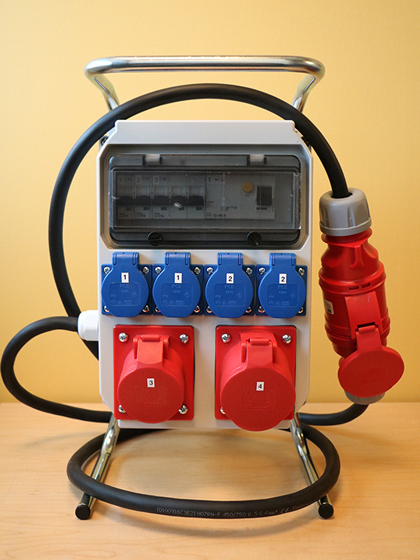 A junction box for the period of the construction work, including the necessary connection work, costs 384 euros (including VAT). The standard solution includes the installation of the junction box for the period of the construction work within 3 metres of the supply point. If you want to have the junction box further than 3 metres from the supply point, you will receive a longer cable at 4.80 euros for each additional metre (including VAT). What is included in a junction box for the period of the construction work? A junction box for the period of the construction work is removable. The junction box has a residual-current circuit breaker and sockets so you can plug in and immediately start work. The junction box can be connected to a supply point with a main fuse of up to 32 A. We will supply a conformity declaration with the junction box, on the basis of which a notification can be filled out for supplying electricity to the supply point before the electrical installation of the house is ready. The technician installing the junction box will give you a user guide and explain any electrical safety issues related to the junction box. Do I have to return the junction box that I used during construction? The junction box will be your property. You can later use it to safely access power outdoors, such as when charging an electric car, for outdoor lighting, or for using a lawnmower or other power tools.